The Viewpoint offers you one of the best views in the state (we humbly believe) enjoyed from a secluded porch and a short walk through the forest to Crescent Beach, where, even on a sunny day, it is not unusual to find yourself alone with nature. The front door the house opens into one long, spacious area with high ceilings and large windows open to the views outside. In this area you will find the dining room and living room, including a large screen TV with premium cable channels. Off that area is the kitchen with a four burner gas range and oven and enough counter space for a whole family to get involved with cooking. Trust us, we've made many Thanksgiving meals in this kitchen. Upstairs also holds 2 master bedrooms, both with king beds and each has its own full attached bathrooms. Situated between the two master bedrooms is another living/dining area with a second attached kitchen – Perfect for large groups who need to spread out. The main living room, first master bedroom and the second living room have sliding glass doors that look out onto the patio with a full view of Cannon Beach and the Oregon Coast. The patio has a built in fire pit, outdoor furniture seats and tables and a gas grill. Downstairs you will find the other 4 bedrooms, one with a king size bed and a view out to the ocean. Two more contain two twin beds each, and the last bedroom has two bunk beds for the kids. There are also two full bathrooms downstairs and a washer and dryer should you need them. The house has high speed internet and is fully wi-fi supported. Barb and the team at the office were fun, friendly and exceedingly helpful. It was a great pleasure working with them. We could not have asked for a more beautiful home. The view was outstanding, everything was clean and comfortable and we loved the fireplace. Perfect! Absolutely amazing, in every possible way I rented this house for a reunion weekend with seven of my high-school girlfriends who were flying in from all over the country (New Jersey, Chicago, Wisconsin, California, and Montana) to attend. I was among the first to arrive at the house and was completely blown away by the breathtaking view -- it truly is iconic, and it's impossible for the pictures to really do it justice. It was so much fun to watch every single person arrive at the house and seriously marvel at the setting -- jaws were dropping all around. Everyone agreed this was going to be a very hard vacation location to top, anywhere (and this is a very well-traveled group)! We spent most of our time on the huge patio, watching the sky and sea change throughout the days and evenings and felt almost no reason to leave the house (though we did go shopping in downtown Cannon Beach one day, and spent an afternoon on the beach close to Haystack Rock). The stars at night were epic -- I have never seen so many in my life. We cooked two huge meals in the very well-appointed kitchen which had absolutely everything we needed, and made S'mores over the fire-pit at night. Several people hiked down to Crescent Beach and said it was gorgeous. The furnishings in the house are beautiful, as well, and the beds were super luxurious, with every comfort provided. I really can't say enough about this property without risking hyperbole, but everything was truly perfect. It was such a privilege to stay here and we will certainly be back, either for a family reunion or another girls' getaway. I can't wait. The House was spacious, clean and views were spectacular. Excellent. Close enough to Town center but very private and quiet. This is a fantastic home. We loved every minute we were there. The view is better than the pictures We really enjoyed our six days at this home. It is well located, an easy walk to town. The house is very well equipped for cooking and entertaining. I walked down the private trail to the beach at least twice each day. The view is better than the pictures on the website. We celebrated our 50th wedding anniversary with our children, their spouses and our grandchildren. There was plenty of room for everyone. We had a fire and singalong at the fire pit every night. Everyone in the family wants to return to this amazing home. The house and view was AWESOME! We had a family reunion here and everyone was comfortable and impressed with the view, the home and the beach. Highly recommend this location !! Wonderful home. The view from this home is just breathtaking. It is unbelievable how beautiful it is! The home has a sweet, private trail through the forest that leads to Cresent Beach - which is also lovely. The house is spacious and comfy and the kitchen was equipped with everything we needed. Thank you so much for sharing this wonderful place! Everything was clean and easy to find. Which made for a relaxing time. Beautiful home with an incredible view. Incredible Stay! This home is amazing! With the most phenomenal view of the Cannon Beach coast area, it's difficult to leave. Very clean, spacious and comfortable rooms gave us plenty of space for the 7 women on our girls' trip, even without the extra apartment. Close to town for shopping and restaurants, a lovely hike down to the beach is right outside your door. Incredible! Completely worth it! Book this home! I can't exactly describe how wonderful this place is. It is located in one of the most beautiful places in the pacific northwest. The house is truly amazing. Very spacious. Comfortable. Well maintained. Lots of beds. There are two sides to the house that can be separated by a door and are perfect for two or more families. Two kitchens, Two living rooms! Downstairs has bedrooms and laundry. We had easy constant communication with the owners/managers of the property and everything went very smooth. The views are incredible and it is the last house on the road before the state park so you are fairly isolated other than a few neighbor houses nearby. There is a fun trail through the woods (15-20 min hike) to walk down to Ecola Beach where you just might have it all to yourself. A quick drive or walk down into the village will get you anything you need in the way of supplies, coffee, food etc. The local pizza place is good and the Fireside restaurant has a wonderful breakfast. We had an amazing time here on the trip of a lifetime. Couldn't be happier. Will definitely come back here if we can! Perfect Property for Large Families We would agree with previous reviewers that the views of the coast where absolutely stunning - majestic even - and the photos on this website could never do it justice. 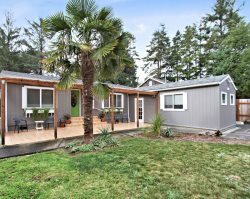 The location of the home, right next to Ecola State Park, is just superb. Additionally, the hike down to the beach is through old-growth forest, which is beautiful in its own right (though perhaps not appropriate for those with knee issues). We had 3 families here for a reunion of sorts (6 adults and 6 teenagers/young adults), and the home was perfect for a group of 12, with the upper apartment included. The upper apartment was lovely and we highly recommend to others (very nice kitchen, living area, large bedroom, bathroom, own laundry, doors out to the deck, separate entryway, etc.). We especially enjoyed the large common room that nicely accommodated our large group and allowed us to have lots of good "family time" (i.e., the style of the home is contemporary and well-designed, with nice open spaces). We cooked most meals in the home and had everything we needed. As for activities, there is much to do within a short drive! We had various family members go to Astoria for a chartered fishing trip; go to Tillamook for ice cream, golf, and hiking; enjoy horseback riding on the beach; explore the breweries in town; shop & hit the coffee shops in cute Cannon Beach; do the nearby "Escape Room", hike in Ecola State Park, etc. I also found a lovely spa in Cannon Beach, just minutes away! And, for those who unfortunately might need it (especially with kids), it does turn out that there is a super-convenient and very nice Urgent Care facility in nearby Seaside :-) We had one very very hot day (mid-90's), and then the weather cooled down in to the low 60's. We highly recommend bringing a wide range of clothing. The evening breezes can certainly be chilly on the patio. We did use the lovely fire pit several evenings watching the sun go down over the Pacific Ocean, and then really appreciated the high-quality washer & dryer to get the smoke smell out of our clothes! The home was clean and the hosts were wonderful. Needless to say, we highly recommend this property to others. Stunning location and a lovely, family friendly home We had a wonderful Thanksgiving at the house. There was plenty of room for everyone, and as the weather was so stormy, it was fantastic to be able to watch the storm on the sea. The kitchen is extremely well appointed, as is the whole house - everything you need is there. The private path down to the beach is very cool too. We'd stay again! Perfect location with majestic views for family reunion's fall winter spring or summer!! This house has everything to offer a family who stays in the area. It offers the most amazing views and family atmosphere one could ask for during a vacation. It is without a doubt the pride of Cannon Beach. The outdoor fire pit and it's views simply cannot be described in words. The house is clean and user-friendly. Would wholeheartedly recommend to anyone!! Fantastic We had a wonderful stay at this Cannon Beach property. The view from anywhere on the property was stunning. The reality was better than the photos. The house was clean and nicely appointed. It is a little off the beaten path, a couple of miles from town, but I thought that was a good thing. If was very quite and peaceful. I spent hours just watching the waves crash on the rocks. We did mostly our own cooking and the kitchen was functional with good pots and pans etc. I can highly recommend this property. Perfect Christmas weather! We had a great time with a group of 9 at the house. The trail down to the private beach area is a little challenging but magical. Thank you so much for making this special house available for rentals. We really enjoyed our time here. Family time enhanced by comfortable easy to use home! Stunning views from the living room mesmerized us all (7 years - 70+) as surf and sun shifted throughout the day. The kids (14-7) had plenty of inside room for games. The grown-ups enjoyed the spacious living areas and the very usable kitchen. The trail to the beach got lots of use!!! On New Year's morning (bright, brisk, windy) we had a family football game and kite flying. No one else was there! Simply, a gorgeous place!! Other days we also walked the trails out to Ecola Point for whale watching and into Cannon Beach for lunches and tidal pool exploration. It was a vacation worth repeating. I hope we can use this home again! A beautiful retreat! The house was absolutely stunning, and the pictures barely do the view justice! My friends and I had a fantastic time staying in this home - and it was absolutely perfect for us to spend the weekend bbqing/cooking, enjoying the fire pit, and making our way down to the beach. The private trail which leads to the perfect, while occasionally frequented by friendly elk, was perfect for making it to and from the beach whenever we wanted. Highly recommend. Incredible Family Vacation We just returned from a week in Cannon Beach. This home exceeded our expectations. We had two families of six (parents with teenagers and young adults) and there was plenty of room for everyone as we rented the additional upstairs apartment. The home is even bigger than it appears in the photos - and the views are truly spectacular. A friend that visited during our stay had been vacationing on the coast for the past 15 years and said our view was the best he's seen. The home is so comfortable and well-equipped. We stayed in every night and cooked (no restaurant could compete with our vista). We built a fire in the firepit and watched the sunset every night. Our day trips included crabbing at Kelly Brighton's marina, surfing at Indian Point Beach, hiking in Ecola State Park, wine tasting in Yamhill, beer tasting in Astoria, and salmon fishing at the mouth the the Columbia River. We never sat still. And this home was the perfect home base. Our family has been fortunate to have traveled to a number of wonderful places and we owned our own place in Colorado for 17 years - and we all agree this was one of our most memorable trips ever. We will definitely be back - and we hope this lovely home is available!